Barney Dreyfuss at Exposition Park in 1903. Bernhard "Barney" Dreyfuss (February 23, 1865 – February 5, 1932) was an executive in Major League Baseball who owned the Pittsburgh Pirates franchise from 1900 to his death. 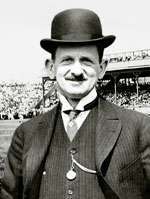 He is often credited with the creation of the modern baseball World Series. He also built one of baseball's first modern steel and concrete baseball parks, Forbes Field, in 1909. During his period of ownership, the Pirates won six National League pennants and World Series titles in 1909 and 1925; only the New York Giants won more NL championships (10) during the same period. Dreyfuss was born in Freiburg, Grand Duchy of Baden in 1865. He attended school in Freiburg and later worked in a bank in nearby Karlsruhe. At the age of 16, he emigrated in 1881 to the US to escape conscription into the German Army. At the time, his prospects of being drafted into the military was high, and as a young Jew, his potential for advancement there was low. Dreyfuss's father, Samuel Dreyfuss (1832–1896), was actually an American citizen since 1861, who had returned to Germany at the outbreak of the Civil War. Samuel Dreyfuss had made a fortune selling spirits to the Native Americans. Dreyfuss enjoyed the game of baseball. He fueled his interest by organizing amateur baseball teams first for the distillery workers, then semi-pro clubs around Louisville. In 1889 the distillery expanded into larger quarters of Louisville. Dreyfuss quickly used the increased profits to buy a piece of the Louisville Colonels of the American Association. The team won the league pennant in 1890 against the Brooklyn Bridegrooms (today's Los Angeles Dodgers). However, the American Association fell apart in 1891. As a result, Dreyfuss moved the Colonels into the National League. One of his best decisions was hiring a local city editor and educated lawyer, Harry Clay Pulliam, to serve as his club secretary; he later appointed Pulliam president. When Dreyfuss immigrated to America, it was Pulliam who taught him how to speak English. However Pulliam's greatest contribution to Colonels occurred when he convinced Dreyfuss to sign future Hall of Famer Honus Wagner to the team. For much of the 1890s, the Colonels were in last place in the National League. In 1899, Dreyfuss paid $50,0000 to acquire full ownership of the Colonels. By this time, however, the National League contracted several teams after the 1899 season and Dreyfuss purchased a half-interest in the Pittsburgh Pirates. As part of the deal, he negotiated the transfer of the best Louisville players, namely Wagner, Fred Clarke, Tommy Leach, Deacon Phillippe, and Rube Waddell to Pittsburgh. To pull off this deal, Dreyfuss accepted an option to purchase an interest in the Pirates, then traded the best of the Colonel's players to the Pirates; he then used this leverage to buy out his partners. The Colonels' president, Harry Pulliam, also left for the Pirates with Dreyfuss and became the team's president. However a bidding war was taking place between the National League and the upstart American League. Dreyfuss was victorious in attempt to keep the new league out of Pittsburgh. However he knew that the bidding war needed to end for the leagues to be prosperous. In 1903, Dreyfuss brokered the peace treaty that recognized two major leagues. It also instituted a single set of rules, established agreements with the minor leagues, set up cooperative scheduling, and recognized each league's rights to its own players. To cash in on the peace between the leagues, an agreement with terms was created by Dreyfuss and Boston Pilgrims' (today's Boston Red Sox) owner Henry Killilea to create the modern World Series. Although his Pirates would lose to the Boston Pilgrims 5 games to 3, the games proved to be a success. Dreyfuss further cemented his reputation by adding his own share of the gate receipts to the players' winnings. At the end of the 1908 season, Dreyfuss decided it was time that Pittsburgh had a new, larger stadium for its growing fan base and winning team. The team's current field, Exposition Park, was made of wood and so close to the banks of the Allegheny River that the outfield regularly flooded after heavy rains. Meanwhile, across the state in Philadelphia, Philadlephia Athletics owners Ben Shibe and Connie Mack had decided to build a steel and concrete venue for their team. Dreyfuss, with no intention of being one-upped, began the construction of Forbes Field. The new park opened on June 30, 1909, and Dreyfuss personally shook hands with the fans as they entered through the gates. The crowd for the stadium's inaugural game included Pittsburgh Mayor William A. Magee, Harry Pulliam (now the National League President), and Congressman John K. Tener, a former Major League player who was soon to become the Governor of Pennsylvania. While Pirates did lose their first game at Forbes to the Chicago Cubs, they did go on to win the 1909 World Series later that year, over the Detroit Tigers. In 1902, Dreyfuss and Pittsburgh Pirates minority owner William Chase Temple were suspected of being the secret owners to the Pittsburgh Stars, a professional American football team in the first National Football League. Both men denied any connection to the Stars' finances, as well as being the team's true owners. While the team's owner on paper, David Berry, insisted that he was the team's sole owner, it was impossible for him to afford the money to finance the team without the backing of Temple or Dreyfuss. The Stars would go on to win the 1902 NFL championship. Dreyfuss died on February 5, 1932, at age 66 in New York City. He was buried in West View Cemetery in Pittsburgh, Pennsylvania. At the time of his death, he was vice president of the National League. Landis, the presidents of both the National and American Leagues, club executives from competing teams, and players such as Honus Wagner and Deacon Phillippe, served as honorary pallbearers at his funeral. ↑ Roberts, Randy (2000). Pittsburgh sports: stories from the steel city. Pittsburgh: University of Pittsburgh Press. p. 246. ↑ Kelly, George Edward (1938). Allegheny County, a sesqui-centennial review. Pittsburgh: University of Pittsburgh, Digital Research Library. p. 357. Cicotello, David; Angelo J. Louisa (2007). Forbes Field: Essays and Memories of the Pirates' Historic Ballpark, 1909–1971. Jefferson, North Carolina: McFarland & Company, Inc., Publishers. ISBN 978-0-7864-2754-3. Leventhal, Josh; Jessica MacMurray (2000). Take Me Out to the Ballpark. New York: Workman Publishing Company. ISBN 1-57912-112-8. Dvorchak, Robert (July 20, 2008). "Fame finally comes to Barney Dreyfuss". Pittsburgh Post-Gazette. Retrieved February 11, 2011. "Barney Dreyfuss". Explorepahistory.com. Retrieved 2011-02-11. "Forbes Field". Explorepahistory.com. Retrieved 2011-02-11. "First World Series". Explorepahistory.com. Retrieved 2011-02-11.